Daiwa has expanded its range of consumer Durables with the launch of semi-automatic washing machine ‘D105SWM18L’ that is claimed to deliver washing with less vibration and less noise. Daiwa Washing Machine has Rust roof exterior body and boasts of a sturdy built. This wahing machine has Double Deck feature that allows you do two loads of laundry at the same time, making it easy to multitask. It is equipped with Bubble Clean technology for a gentle cleaning performance even at low temperatures. The Machine comes with the large capacity along with the double unit-layer washtub, that brings outer tub to hold water and inner tub with holes for draining. 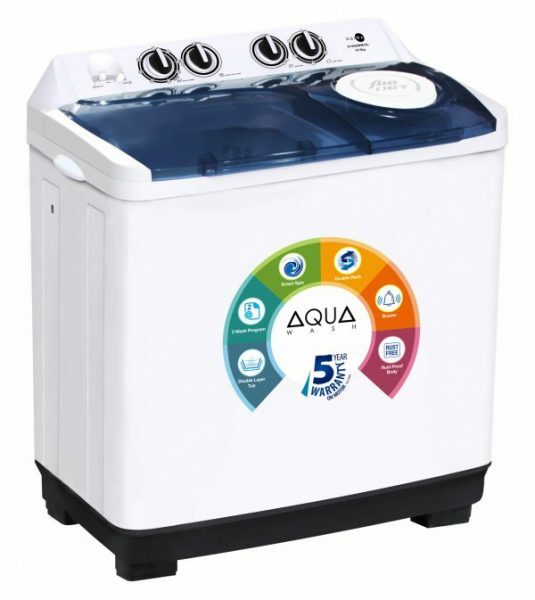 During the spin cycle, the Machine with its unique Air Turbo Drying System rotates the drum rapidly, while dual air intakes draw in more air, extracting more water from your clothes, helping them dry faster. This machine gives you alert when the washing cycle is over by a buzzer. It also comes with the spin dry safety lid that helps users to dry the clothes wihout any trouble. This washing machine has thermal protection for the motor and its superior quality insulated wires, prevents the machine from any malfunction. This semi-automatic 10.5 Kg Washing Machine is available in the shade of White for Rs. 15,690. Apart from this, Daiwa has also launched two new models which includes D90SWM18L (9 Kg) and D95SWM18L (9.5 Kg) priced for Rs. 13,990 and 14,690, respectively.